Jessica Simpson Wedge Open-toe Sandals Heels NEON Hot Pink Size 6.5. Condition is Pre-owned. Shipped with USPS Priority Mail. Scuff mark on inside of one shoe. See all photos for more details and feel free to contact me with any questions. Jessica Simpson Strappy Sandal Powder Blue Leather with ​Buckle Ankle Strap Size 6½ B 9¼" Inner Shoe Length 3" Inner Shoe Width 5" Heels Store Display Please Check Your Shoe Measurements. RUBBER BOTTOMS. SIZE 6 1/2. Style: Waleo. Suede Leather. Orange, Tangerine. Clubwear party casual. • Jessica Simpson brand • Black Patent leather with Tortoise shell platform heels • Size 6.5 B • 4" heel height • Open Peep Toe style • Fabulous for work and Play!! Buy Now and avoid bidding wars!!! Very nice and stylish shoes in good condition. a few small scratches which hard to notice. see last two photos. Adjustable sling back strap. Cork-like heel. New ListingJessica Simpson Size 6.5 Orange Color Strappy Sandal Heels Cute!! Jessica Simpson black leather upper peep toe stiletto size 6.5 B. Preowned good condition with one small bruise on the left side heel. Barely noticable. No other blemish. High heel 4.5 inches high. Very clean inside and outside. The front of the shoes has a tapered platform 1 inch high. Very comfortable for all day wear. Good pedicure, slip them on and go. Upper leather manmade lining and soles. The soles appear to be non slip rubber. Wedge Heel. Preowned In Excellent Condition. Size: US 6.5 Color: Black. Shoes look new. Only thing that shows wear is the sole. 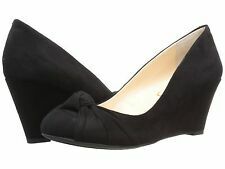 Peep toe Slip on high heels size 36.5 pre-owned in very good condition. These heels have a blend of Clean Classic and high-end glamour, making these platfrom clean& luxurious and definite head-turners. Strap Type: Slingback. Toe Style: Peep Toe. Fashion Sneakers. Style: Platform. Platform Height: 0.75. Heel Type: Stiletto. Heel Height: 5.25. These shoes typically show a little more wear in their soles and may have blemishes such as scuffs and/ or wrinkles. Heel Type: Wedge. Dress & Formal. Style: Wedge. Fashion Sneakers. Toe Style: Round Toe. Heel Height: 3.25. Strap Type: None. Closure Type: Slip on. Slightly worn upper(scuffs), inner, insole(fading), heel(scuffs/worn tip), and sole(scuffs). I am getting rid of my very high heels because I can no longer wear them. There are two spots on the right shoes (bought that way) but it is not noticeable. Slightly worn upper(scuffs), inner, insole, heel(uneven), and sole. SHINY PATENT LOOK. We have expanded our product line to more than golf. We are here to help you in anyway that we can to make a great decision to buy this item. They were finished with this line of inventory.